Surely, everyone who loves horror movies knows very well about puppets. They are one of those having no life things. But through humans, it carries the same form and soul as a real person. These puppets appear not only in horror movies or cartoons but also in real-life entertainment. The puppet has the skeleton of the famous comedian Jeff Dunham or puppet shows, including the water puppet, which is one of the popular cultures in Vietnam. Besides, wooden puppets are also a favorite ornament and toy. It can be said that the origin of the puppet was a long time ago when the appearance of the puppet was found in India in ancient excavations in the Indus valley. According to ancient records, the art of puppet-showing appeared in Tamil literature in the 2nd century BC. Meanwhile, Greek is also known for this art thousands of years ago. It is found in Herodotus’ document, which was written in the 5th century BC. The shadow-puppet are also called wayang. Wayang appears in Indonesia on Java Island. As a beautiful country surrounded by the sea, Indonesia is where I studied for 5 months. On that occasion, I have enjoyed a shadow puppet show in this country. Wayang Kulit is the first show about puppet shadow I saw; it is also the most famous puppet genre in Indonesia. One can say that the belief of pure theory forms wayang Kulit, Indonesian people believe that ancestral spirits can affect the lives of living beings, such as protection or intimidation, and they often return at night under the form of shadows. Artisans here will conduct rituals in the form of puppetry to call for their ancestors to help. The puppets carry the soul, will be dancing, flying, walking, fighting to gain victory, suffering, and love behind a thin curtain where shadows appear. Along with that are the sound, the light and the stories presented in the stage. These puppets are made of leather poddy or buffalo skin. In a puppet set, there are about 100 to 500 puppets, the height of puppets ranges from 10 to 30 inches (25-75 cm). The puppet makers use patterns to sketch lines and draw elements on the skin, then cut the body of the puppet and after that left the pieces of the arm separately. Its features are chiseled with the best woodworking chisel tools. It will take weeks to complete a beautiful puppet. They are followed by painting and polishing. According to folk beliefs in Indonesia, puppets themselves only show the physical part of the character while the critical pattern is its shadow which represents the soul. 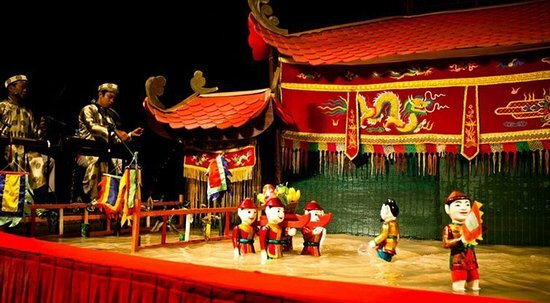 Water puppetry is an extremely famous cultural art in Vietnam. It was born based on wet rice culture. Water puppetry is a unique art form of Vietnam, and it impressed dramatically to me. I have watched a water puppet show at the central puppet theater in Hanoi. It was a different side with the shadow-puppetry that I have seen in Indonesia. I can see all the characteristic of puppet, not just the shadow, and the form of puppet-like Wayang. The wood Fig tree is a raw material for making a puppet, light wood and floating on the water. The Puppet is chiseled, cut to create stylized contours, then sharpen, polish and decorate with various paint colors to add character lines to each character. The shape of the puppet is usually fresh, funny, cute and highly symbolic. The tangled body is the floating part of the water that represents the character, and the base is the part below the surface of the mangrove water as a kind of wood levels for puppets. It will keep the puppet floating above, and it is the place to control the machine for the puppet movement. Water puppets in Vietnam often show stories in history, heroic battles of the Vietnamese nation, stories famous as Tam Cam and Thach Sanh. Marionette can be said to be the most widely known puppet in the world. From an early age, I knew this kind of puppet through a Pinocchio movie, this is a famous animated film about a boy in the shape of a wooden puppet, and it is my favorite movie when my TV screen is still black and white. A marionette is a puppet controlled from above-using wires or strings. A marionette’s puppeteer is called a marionettist. The control bar for a marionette can be horizontal or vertical, it will change later for the professional marionettes to work comfortably, the motifs must be sculpted subtly with the best wood chisels. Therefore, the formation of a puppet is very complicated. The coupling between parts must be firmly designed and the smoothness of movement. Moreover, puppet makers have to calculate carefully and skillfully to control puppets better. Marionettist is a prevalent genre in eastern Europe (UK, Scotland, Germany, Austria, Picardy, Lafleur, and the US) in the BC century. A puppet is an inanimate object, but it creates a strong impression of its shape and expression, an object that is represented for humans.